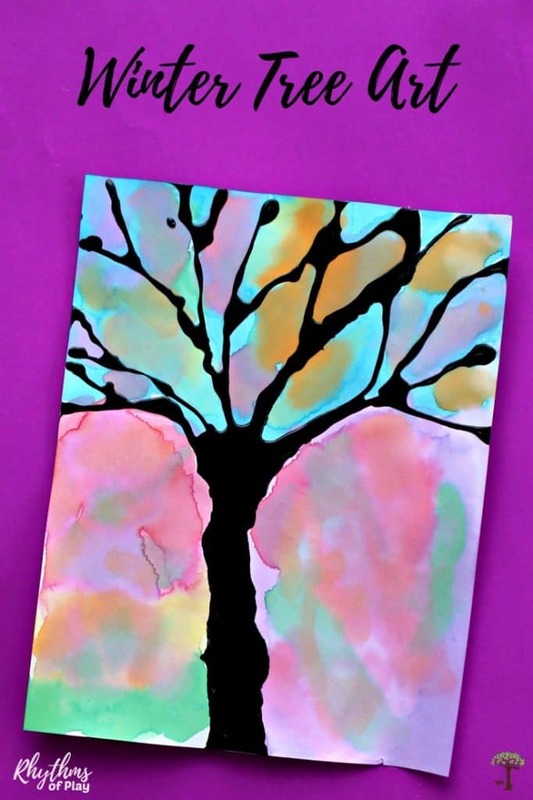 Try this gorgeous winter tree silhouette art project with the kids! 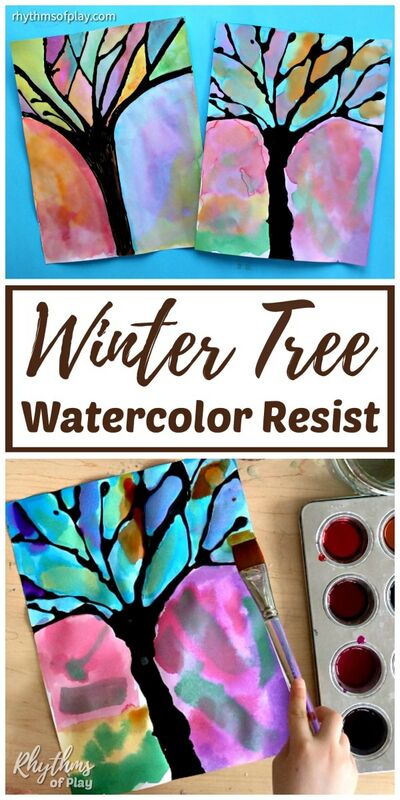 Paint with watercolors and use black glue a watercolor resist medium to create colorful winter tree art. Make this gorgeous winter tree painting today! Working with black glue and watercolor paints is a process-oriented way for children to practice working with watercolors while they learn about color mixing and the science of resist mediums. Make some winter tree art with black glue and watercolors with your children today! Creating winter tree silhouette art with black glue is super easy! We like to spend one-day using black glue to draw winter trees, and another day to paint them. This both allows time for the black glue to dry and gives children an opportunity to spend time creating two types of art. 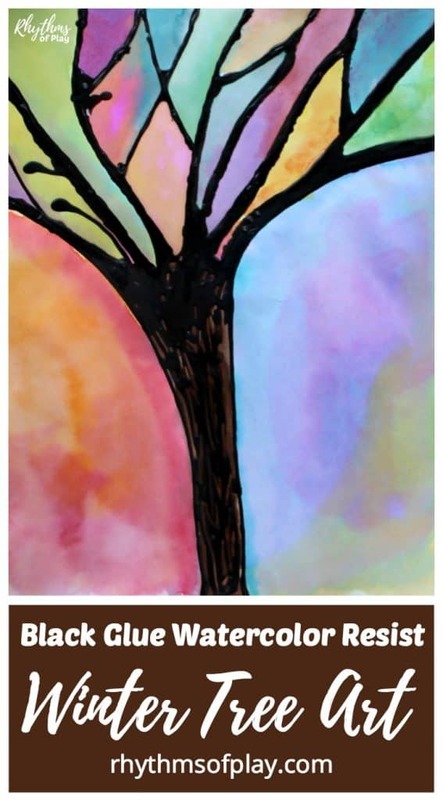 A winter tree silhouette with black glue on the first day, and a color-filled watercolor painting on the second! Scroll down for the winter tree art supply list and the step by step directions to create winter tree silhouette art. Making black glue is simple and does not need to be measured. All you need to do is mix white glue with black acrylic paint to make black glue. We make our black glue by adding both ingredients to an old white glue bottle. Just shake it up to mix, and squeeze it out to use! We are constantly adding a mixture of white glue and black acrylic paint to our “black glue bottle” to make more for all of the black glue art projects we have created. A little black paint goes a long way so you don’t need much. We never measure and it always turns out fine! Don’t worry about making your “black glue” look black. Because white glue dries clear, black glue will often appear grey until it is completely dry. 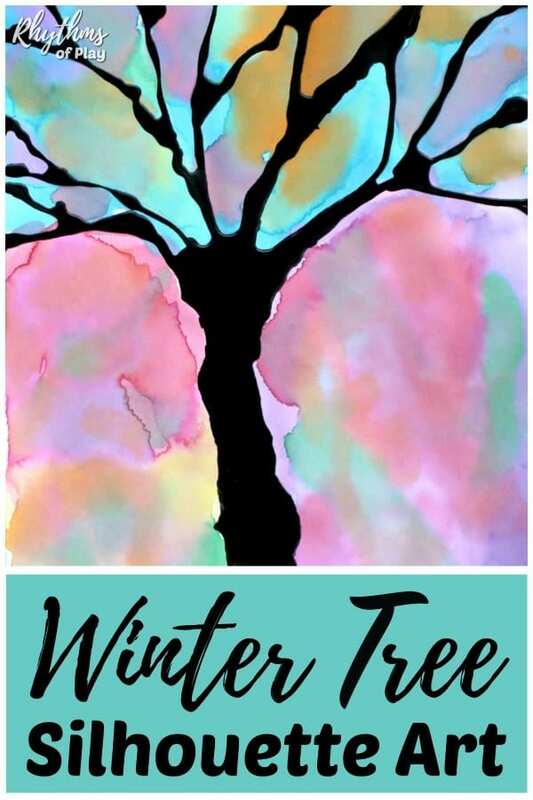 Draw a winter tree on watercolor paper or heavyweight cardstock . You can use a pencil to draw a winter tree first and then trace it with black glue, or use black glue to draw the tree directly onto the paper, up to you! Allow your black glue winter tree silhouette art to dry overnight. The black glue will not resist watercolor paint unless it is completely dry. We like to spend one-day making winter tree silhouettes, and another day painting them. Invite children to paint the winter trees they drew the day before. Allow your children to use and paint with any color that they would like to give them an opportunity to learn about and experience color. Working with watercolors is a process-oriented way for children to learn about color mixing in art. For more information check out wet-on-wet watercolor painting. Play the video below to see my daughter’s winter tree painting! Head on over to have a look at all of the other watercolor black glue resist art projects we have created for even more black glue and watercolor paint fun! We hope you enjoy painting winter trees with your children! Don’t forget to pop over to have a look at this amazing collection of winter art projects and painting ideas. You may also like to have a look at this cute collection of Valentine’s Day art projects. Halloween Art Projects Kids LOVE! What a great effect! I’ve not tried making black glue before. I’ll give it a try. Yay! I’m so glad you’ve been inspired to try black glue resist art! It’s really easy to make, the problem I see more often than not is that people think they need to make the glue look black and end up using too much acrylic paint, and this can add black to your watercolor painting if you use a lot of water. A little black acrylic paint in a white glue bottle, well shaken, goes a long way! Enjoy!